Mass shootings are common for one reason: weak gun control. We’ll never know what killers are really thinking. But we can make them less deadly. 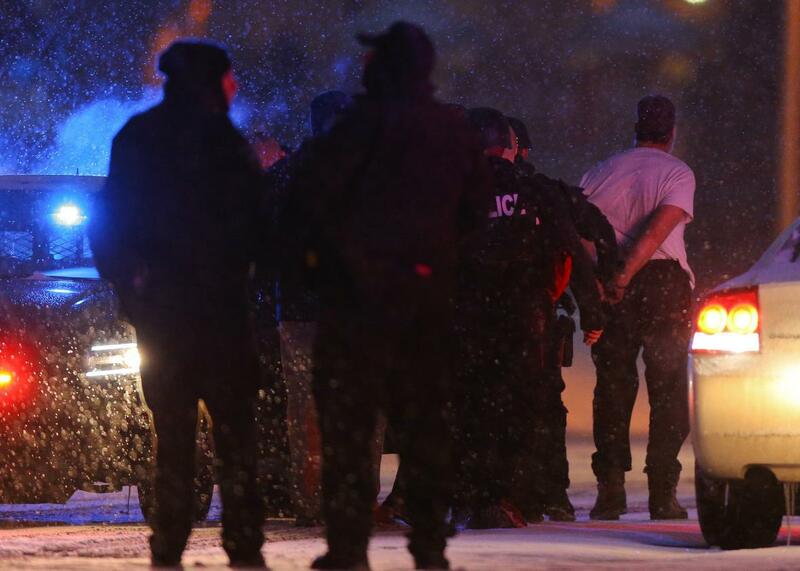 Suspect Robert Dear is led away by police after three were shot dead and many wounded at a Planned Parenthood facility in Colorado Springs, Colorado, on Nov. 27, 2015. I’ve had to make statements like this too many times. Communities like this have had to endure tragedies like this too many times. It’s an endless stream of statements about having to make statements about having to make statements. And the statement is never made, or is never made strong enough, to actually pass a law, or maybe even to change one mind, as far as I can tell. You know any hate crime is a horrible thing no matter from where it comes and should be condemned very strongly. Well this is a tragedy, it’s obviously a tragedy. Nothing justifies this. And presumably this man who appears deranged if nothing else will be tried for murder as he should be. But it’s a tragedy especially on a holiday weekend. We don’t fully know the motivations of this deranged individual. We know that he was registered as an independent and as a woman and as a transgendered, leftist, activist if that’s what he is. Several Republican presidential candidates on Sunday condemned the attack on a Planned Parenthood facility in Colorado Springs, but stopped short of agreeing with liberal critics who say that fiery anti-abortion rhetoric contributed to the shooting. Know what? I actually agree with that. I can’t say what did or didn’t motivate the shooter. I can say that it is a fool’s errand to parse the motivations of a mad man and to say “but for these dangerous ideas in his head those people would be alive.” It is much truer that but for the dangerous weapon in his hands the people would be alive. The anti–Planned Parenthood videos were misleading. They conflated legal reimbursements, which are only allowed in a few states, with selling baby parts. They made Planned Parenthood officials look bad because they talked about abortion procedures matter-of-factly as they were chomping down salads, and all the videos were unethically obtained. Also, I want to note that there does seem to have been an uptick in abortion clinic vandalism and arson since the videos came out, though it should be noted that Clinton-era safeguards have worked really well in keeping abortion providers generally safe. Now many Republican candidates, and conservatives in general, compare the Black Lives Matter movement to the anti-abortion movement. Their motivation is to deflect, but I think there’s a point to be made. Because, in fact, there have been self-professed followers of the Black Lives Matter movement who have killed cops. Late last year a deranged man killed his girlfriend in Baltimore, took a bus to New York, posted his intention to kill police officers on Instagram, and then killed two NYPD officers. He said he was going to do it. He said why he was going to do it. He made reference to a high profile victim of police violence, and then he killed two policemen. Other killers of cops may have less clear motivations, but it’s plausible that a few police officers are dead because a few broken individuals mistook or twisted the aims of the Black Lives Matter movement for their own ill will. Well in that first shooting the shooter was walking down the street with his rifle—an AR-15, in fact. Concerned citizens saw him and called the authorities and said, “There’s a man walking down the street with a rifle.” And the dispatcher told these citizens, “Well there’s nothing we can do about that because Colorado is an open carry state and the only thing that’s going to stop a bad guy with a gun is—” Oh too late, three innocent people are now dead. That was Halloween day. In between that mass shooting and the Planned Parenthood Black Friday mass shooting, the website Shooting Tracker chronicled 31 additional mass shootings. Forty-seven dead and scores more wounded. Now these were just the mass shootings. These were not the one-off accidents, the suicides, the targeted slayings, the gangland beefs. No presidential candidates of either party were called on to make statements decrying the Ohio man who killed his neighbors and their 7-year-old son; the quadruple murderer in Kentucky who shot a family then burned their house; the Texas man who shot six at a campsite; the Jacksonville, Florida, man who made the mother of his 5-month-old twins hold their babies as he shot her, and them, and then himself. Guns. A lot of people have a lot of terrible ideas: Sometimes it’s getting revenge on an ideology, sometimes it’s getting revenge on the police, sometimes it’s getting revenge on people you personally know. But without guns, the death toll would be much lower. I’m not saying that all the hateful rhetoric around Planned Parenthood didn’t unfairly nudge them closer to the crosshairs. But it’s not just bad ideas and angry men that lead to these obscene death tolls. It’s that the ill heads with these twisted ideas can so easily access a means of lethality uncommon in the civilized world. We are an aggrieved, worked up, angry people. But an American who is aggrieved or enraged or unmoored is more deadly that an Englishman or an Australian not because of the extremes of our discourse, or the extent of our aggrievement. The bad idea that people are most dying from is not an anti-abortion idea or an anti-cop idea or anti-Western, anti-Christian. It’s anti–gun control. That’s the deadliest and most ignorant idea of all.